This is one of the most famous mushrooms in the world! This magic mushroom is still used in native rituals in Bali and sold to tourists as psychedelic substance. Its name come from the admirable golden color of the caps and his so-called teaching capacities. Apart from its higher potency, the Ecuadorian also produces a far more consistent trip than the Mexican mushroom. The fact is that Psilocybin is closely related to DMT, a tryptamine. It was named after the Psilocybe specimens of mushrooms. For sure that sounds difficult and maybe you haven´t even heard of some of these words. But don´t worry, we explain it in a few easy to understand steps. The most common substance is psilocybin, but all psychedelic mushrooms that produce psilocybin also produce psilocin. A few magic mushrooms have a higher amount of psilocin than psilocybin, which depends on the strain. 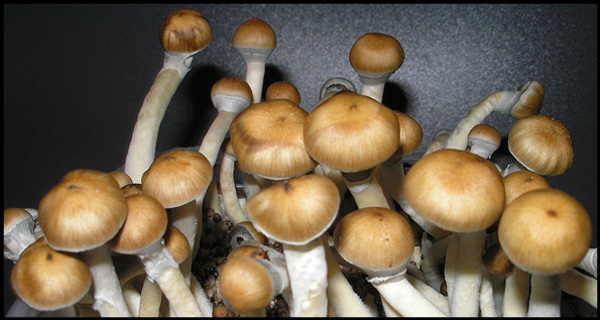 For example the Psilocybe Cubensis mushroom mainly contains psilocybin and only a very small amount of psilocin. 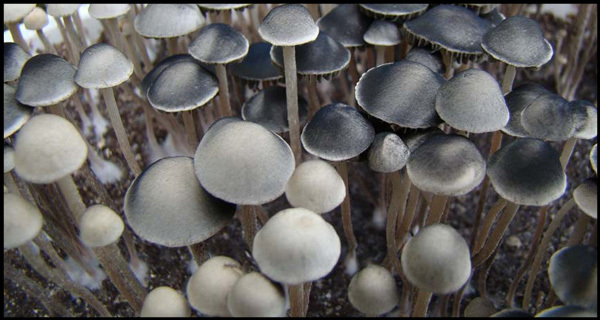 On the other hand, the Copelandia Cyanescens, also known as Hawaiian mushroom, produces much more psilocin and only a small amount of psilocybin. These two substances; psilocybin and psilocin are what we will to look at. However there are more substances that create specific ‘psychodelic’ effects. Two of these substances are baeocystin and norbaeocystin. A third substance, which is speculated to be a product from psilocybin mushrooms, is 4-AcO-DMT. However, it is unconfirmed that 4-AcO-DMT is produced from natural magic mushrooms. It is so far only available as an artificial chemical product. Why are these components, especially Psilocybin, psychoactive? This is one very important question. In order to understand why any drug has its effects, you should be aware that its molecular structure has a main body which is similar to substances normally created by our own body. In this case the substances act on our serotonin system via what are known as 5-HT receptors. The serotonin system is also the main area where LSD and mescaline have their effects on but unlike magic mushrooms they also affect the dopamine system. The active components from magic mushrooms have no effect on dopamine at all. And yes LSD is in the same chemical category, it is also a tryptamine. Mescaline on the other hand is a ß-Phenethylamine and is closer related to amphetamine and ephedrine than to Psilocybin. That means that it is also possible to reach the same receptor group with drugs from different chemical groups. But most of the tryptamine based drugs affect the serotonin system, the ß-Phenethylamines mainly affects dopamine and adrenaline and only a few of them serotonine. Most known examples for these two groups are: tryptamines – LSD, DMT (Ayahuasca), Psilocybin; ß-Phenethylamines – Mescaline, MDMA, Amphetamine, Ephedrine, 2C-B. Most of you will know most of these substances and do now understand the main difference in Effects. At the end it doesn´t seem to matter what you take, all substances are most likely to be transformed to Psilocin within the human body. Psilocybin and Psilocin were detected by Albert Hofmann (the inventor of LSD). Since Psilocybin was the substance that occurred in much larger amounts within the psychedelic mushrooms, it was first expected to be the main active component. Psilocin is also known as 4-HO-DMT, so here you see already how far it is related to our own bodily produced chemicals. Of DMT (Ayahuasca, Yopo) it could be said it is only a drug when the body levels of DMT exceed the normal amount. Because Psilocin is so closely related, it can perfectly make use of the way DMT takes in our body. The other substances mentioned above, baeocystin, norbaeocystin and 4-AcO-DMT, are also transformed to Psilocin and then become psychoactive. For the baeocystin that still has to be finally confirmed, as research on this substance is very limited. But all routes lead back to Psilocin, known as 4-HO-DMT. Baeocystin seems to take two steps to Psilocin, first it is converted to Psilocybin and that is finally changed into Psilocin. Self-administered tests from scientists had proven this, reports state that 10 mg of baeocystin had the same effects as 10 mg of Psilocybin. But why do magic mushrooms then have different effects? There are many things that affect the effects from hallucinogenic mushrooms. Most important is the Set and Setting. The set is the area where you take the psilocybin mushrooms, at home, with friends, at a party, with strangers and so on. The setting is your own current state, do you feel happy, sad, angry, tired and so on. Another important aspect is the way in which you administer the magic mushrooms and if your stomach is empty or full. When you take the mushrooms on an empty stomach your body can quickly digest them and the active components are rapidly absorbed. That means the effects start quickly and the peak is reached fast. When your stomach is full, the digestion of the magic mushrooms is much slower, thus the active components are absorbed much slower. In that case it takes more time until the effects begin and it takes longer until the peak is reached. The routes of administration can also decide how fast the active components are absorbed and transported. If you chew the magic mushrooms for a long time, a lot of psilocybin can be absorbed by the mucosa in your mouth. This speeds up the onset and the time to reach the peak. When you just chew them a few times, so that you can swallow them as quickly as possible, your stomach has to do all the work and the psilocybin is absorbed in your intestine. Another way to make the psilocybin quickly available in your body is to make a tea or shred the magic mushrooms in a mixer before taking them. But these methods sometimes create unwanted side effects, especially nausea and vomiting. But also the amount of active components in your magic mushrooms has influence on the effects. When you are taking strong magic mushrooms the effects also start earlier and the coming up feels more intense that directly influences your setting and can create different effects. Last but not least, the relation between the active components in magic mushrooms and the main substance also influences the onset, coming up, peak and total duration. Since you know about set and setting, you know why that can change the experience you have. Copelandia Cyanescens is so far one of the strongest magic mushrooms available today, but it also contains Psilocin as main substance. Your body doesn´t have to transform it before it is active, if that is combined with long chewing and an empty stomach, it is likely that the effects start within 15 minutes after consumption. The peak is than reached within 45 minutes, that´s the time before some other magic mushrooms become active at all. If Psilocybin is the main substance in magic mushrooms, then there is no way around the transformation to Psilocin before the trip begins. So even if you take magic mushrooms of the same strength as Copelandia Cyanescens, they will not start to work as quickly as them. For 4-AcO-DMT the next step is also Psilocin and it will work similar like Psilocybin in onset, coming up, peak and total duration. With baeocystin the data is limited and so it can not be said how it compares in these matters with the other substances. One more thing; it is also not the same when taking pure substances, no matter if extracted from natural mushrooms or produced the chemical way. A pure substance is absorbed rapidly, as there is nothing else that needs to be digested. So do not directly take the same amount of the chemical that would be in your average dosage of magic mushrooms. The quick onset and coming up then is sometimes overwhelmingly strong! I get nausea when using magic mushrooms, is psilocybin producing this? Some people get sick through the effects, but Psilocybin and the others do not produce nausea and vomiting through themselves. The people who get nauseous also often get that when taking other psychedelics like LSD or Mescaline. But in most cases this comes from the use of dried magic mushrooms. Dried mushrooms are rather hard for your body to digest and can so cause some trouble in your body. Ranging from nausea and vomiting to diarrhea. The worst case would be that you have everything at the same time, but luckily that only happens to very few people. Side effects like this can be avoided through chewing your magic mushrooms for a while until they are nearly dissolved. Also do not chew all the magic mushrooms at once when you receive such problems, spread your dosage over 15 minutes. Pure substances (the components themselves of the magic mushrooms in pure chemical form) do not produce any of these side effects, as they are no problem for your digesting system. Bringing 17,000 Shroom Lovers together on our Facebook Page seems like a good reason to celebrate with a Magic Mushroom Growkit Giveaway, doesn't it? Anyone interested in documenting the experience of growing their own Magic Mushrooms at home has a chance to win an all in one Growkit of their choice, courtesy of ShayanaShop, so just let us know why we should choose you...then get your cameras and your GoPros ready!! So what exactly are Mexican magic mushrooms and what are those philosophers stones? First of all the Mexican is just the common name for the specimen Psilocybe Cubensis, because its botanical name is somewhat less handy. The same is done with Psilocybe Tampanensis, known as philosopher’s stone. Additional you might have seen different names with the same botanical name. 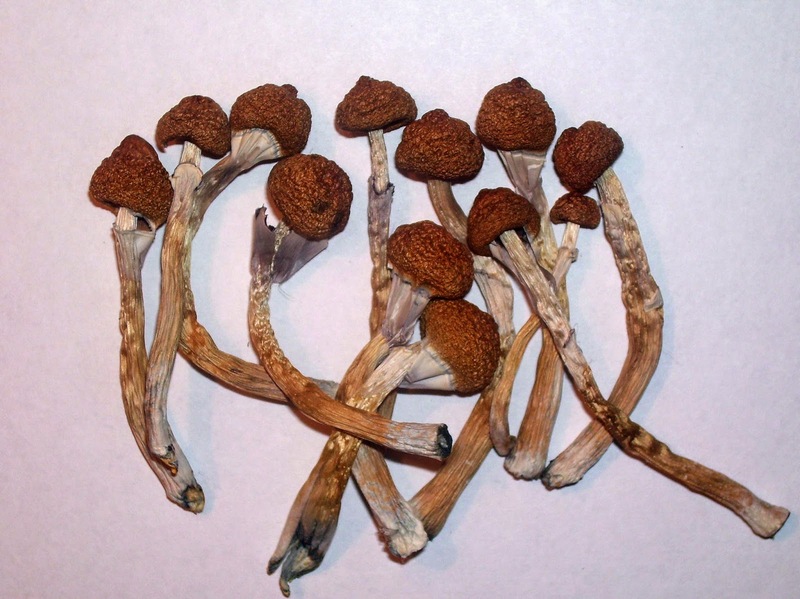 For example, Thai magic mushrooms, Mexican magic mushrooms, the McKenna and so on, but all are Psilocybe Cubensis. Is it just a trick to make you think they are different? No it is not, we will get back to that later. Now let´s take a look at Psilocybe Cubensis in detail and then at Psilocybe Tampanensis. The Psilocybe Cubensis has its roots in Africa. It must have been developed by nature in this continent. Later this hallucinogenic mushroom started to spread around the globe. However, the exact way how Psilocybe Cubensis went all around the globe is unknown. It only can be estimated how and why it traveled so far. Scientists believe that this psilocybin mushroom started to spread with human beings. We all have our roots in Africa too. And we never move without taking our comfort with us. Or would you move into a new home without your video console, TV and what not? Of course you wouldn´t and so these early people also took their animals, seeds from plants and much other things with them. A lot of animals can digest plants, mushrooms and other things, which we could never digest. Because of that some animals can also eat psychedelic mushrooms without getting any effect from it. The humans begun to move into the north and so started to colonize what we know today as Asia and Europe. As weird as this may sound like, it was the animals that kept the magic mushroom spores of Psilocybe Cubensis in their dung. Humans were able to move over sea with boats, hence the Psilocybe Cubensis did that too. Yet there doesn´t seem to exist any fact pointing to the use Psilocybe Cubensis by early people. The Psilocybe Cubensis strain is a pretty sturdy mushroom and can grow in a quite large variation of climates. So it felt home in every landscape that offered tropical or sub-tropical conditions. The first colonies of this psychedelic mushrooms outside of Africa were in Asia. In Europe the winter is quite hard so the places where it can be found are limited. The next step for Psilocybe Cubensis was to move across the ocean to the American continent. The continental plates move during thousands of years, so where we have water today, there could have been land ten thousand years earlier. So maybe people, today known as Indians, brought the Psilocybe Cubensis to America. There was a frozen passage from Asia to America, which had been used to reach the continent for the first time. But maybe it also reached it through later travelers of which we do not have documentations about their journeys. Now you know why this hallucinogenic mushroom can be found all around the globe. This happened so many years ago, that the Psilocybe Cubensis had time to adapt to its new area. Because of the adaptation to different settings, Psilocybe Cubensis variations developed in the different regions of this world. This is the reason Psilocybe Cubensis have different sizes, content of active components and different growing speeds. 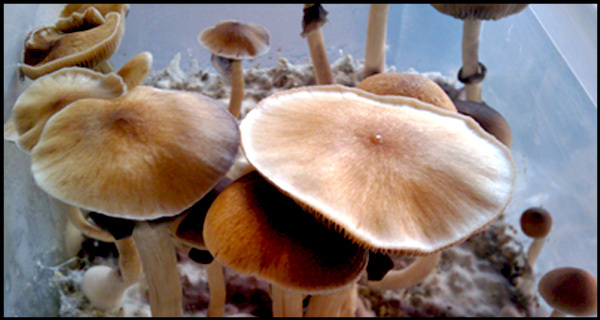 For example, the typical Mexican mushroom is a large mushroom with medium strength, while the Thai mushroom grows much smaller and contains more Psilocybin. So do not worry, you don´t get scammed when ordering several magic mushrooms all labeled as Psilocybe Cubensis. Data about Psilocybe Tampanensis is very limited, it had been found in the 70s in the swampy areas of Tampa in the USA. Today we can be very happy that the man who found it collected some samples of psilocybin mushroom. Otherwise we wouldn´t have a chance to get it anymore. After this first finding, nobody had seen it again in the wilderness. There is an unconfirmed report that it was found again, but no samples had been taken, thus it can be questioned if it is true or not. Some scientists speculate if it was only a step between two points during the evolution of another psychedelic mushroom. So no matter where you buy magic truffles or where your spores come from to grow it, they all range back to the material collected in the 70s. Yet there are no natural variations, also no real ones made through artificial growing. Of course there are various magic truffles available, but other Psilocybe specimen are able to produce them too. For example, the Psilocybe Mexicana can also create them. 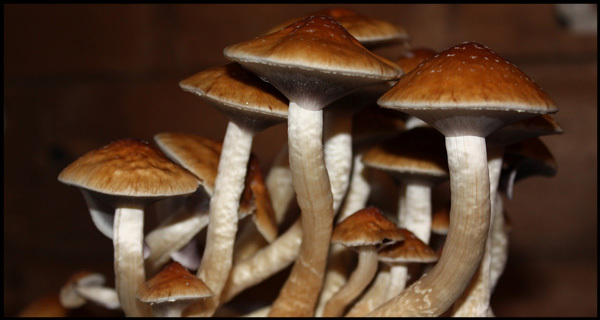 The main difference is that Psilocybe Cubensis grows the mycelia under the earth and than starts to produce the psychedelic mushrooms above the ground. What we commonly call “magic mushrooms” are therefore just the fruits of it, not the mushroom itself. You could compare it with an apple tree; you just collect the apples which contain the seeds, but not the whole tree. The Psilocybe Tampanensis on the other hand does the same, but it is also able to form the underground “truffles”. The magic truffles are not like the mushrooms above the ground, they are very tight mycelia. The truffles are built to resist during bad conditions. When the mycelium starts to form the truffles, the mushroom is prepared to survive. The small mycelia twines could be easily destroyed by cold or dry conditions. However a hard and sturdy knot, made of extremely tight mycelia is able to resist it. When the climate gets better again, the magic truffle starts to grow again and continues to build mycelia twines and finally form the magic mushrooms above the ground. Not every mushroom has the ability to build truffles, therefore the Psilocybe Cubensis cannot produce them, but the Tampanensis can do it. Why is Psilocybe Tampanensis sold as truffle and not as magic mushrooms? Every market needs new ideas and new products, just an average new magic mushroom wouldn´t be any special. So it came in quite handy to have one ready that can produce underground magic truffles. Additionally, the truffles contain somewhat more psilocybin than the mushrooms growing over the ground. But maybe more important are the aspects of the law. Mushrooms are separated from plants and animals; therefore they were legal again for a short time in some countries like Germany. The laws listed the active components in magic mushrooms as illegal and the plants they contain them. But since mushrooms are no plants, the law was incorrect and the magic mushrooms where sold again until the law texts had been updated. In other countries, the magic mushrooms are illegal, but they are defined by the law through the “fruits” above the ground and do not include the truffles under the ground. That way the magic mushrooms are illegal, but spores and mycelium are legal, which also includes the hard mycelium knots, known as magic truffles. The latest example is the Netherlands; the land of milk and honey for every psychonaut. Here the fresh and dried hallucinogenic mushrooms of all kinds had been sold in Smartshops. Because of that, the government had to react. Too many travelers just came because of the legal drug use and the result is that they banned dried magic mushrooms. But like often happens with laws, it did not achieve what it was aiming for and the Smartshops started to sell fresh psilocybin mushrooms. However psychedelic mushrooms can only be stored a few days until they are not good anymore, similar to other mushrooms. 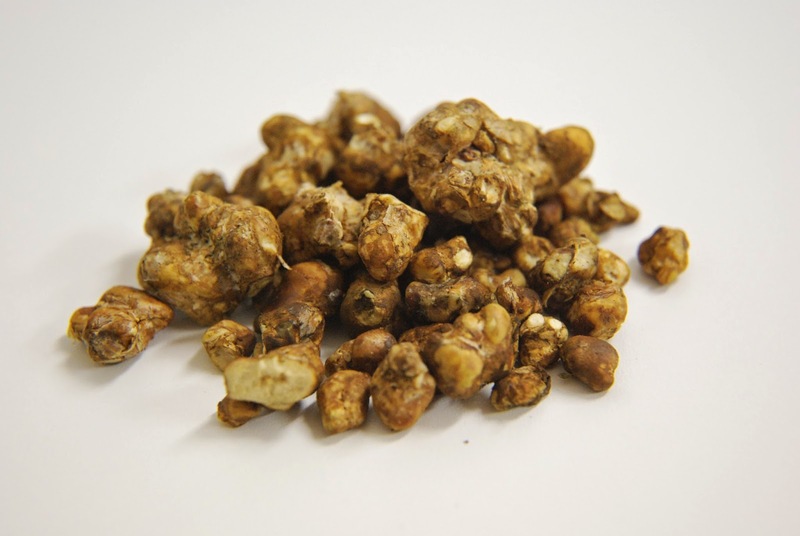 This gave the magic truffles a whole new meaning since these sclerotia can be kept in the fridge for up to 3 months. First there were mainly the Psilocybe Tampanensis sclerotia, now you can get magic truffles in the Netherlands from more than 10 different Psilocybe specimens. To grow your own hallucinogenic mushrooms you should make a decision which way of growing you prefer. But we start here with general growing techniques, which you can use to get started and to get a feeling for psilocybin mushrooms. First we explain you the most important rules when growing hallucinogenic mushrooms. After that, you could use our checklist to organize everything you need, prepare your workspace and all that kind of stuff. Than we go through step by step. - The very first and most important rule is: Keep everything clean, always! Work sterile, so that no mold can contaminate your magic mushroom grow environment. - Better wash and clean your utilities twice. - Always make the air on your workspace as sterile as possible with your Bunsen burner flame. - Never open something in any state of the growing process when it is dusty, for example you cleaned some old books and some dust is still flying in the air. Better wait for the next day. - Never use contaminated mushrooms; they require an environment that is also the favorite from unwanted mushrooms and also a lot of bacteria. Very often these are poisonous and can lead to serious adverse health effects. - If something was contaminated, do not worry; that can happen from time to time, just throw your magic mushrooms away. It doesn´t cost much money, the psychedelic mushrooms re-grow very fast and the time you invested is quite minimal. For first time growers or beginners in general, you should pick a strain of magic mushrooms that is easy to grow. 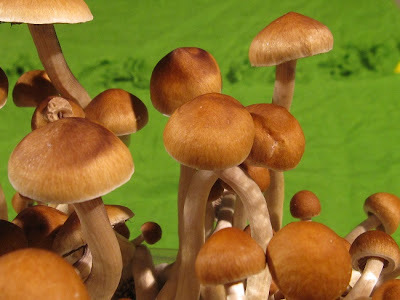 Do not just start with a Copelandia Cyanescens or similar right away, they are the strongest hallucinogenic mushrooms, but are way more difficult to grow. 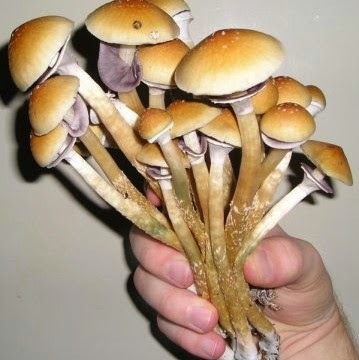 A good strain for beginners is Psilocybe Cubensis, it has a lot of variations, but all are rated as easy to grow. - One spore print or syringe from your favorite Psilocybe Cubensis mushroom. - Petri dishes with already prepared agar-agar in it, regular sold in packs with 5 or 10. So one pack is enough. - One Bunsen burner with gas bottle. - One large and wide needle, a knitting needle will do well. - 3 or 4 big preserving jars. - Several kg rice flour, best you get a big pack with 10 kg or more, so you got a stock. - Several liters Vermiculite, also more is better to have a stock. - A cooking pot, best suited is a pressure cooker. It must be completely sealed and the hot steam will reach every corner to make your tools sterile. - 2 or 3 boxes where your magic mushrooms will grow. So a large styrofoam box could be used, or you build one with a few planks, only important is that it can be opened and closed. Now cover all inner parts of the box with an airtight foil. The foil is required to secure your box from water and humidity, but it also keeps the humidity inside for your hallucinogenic mushrooms. - One very sharp knife, best suited is a scalpel. - Not required but useful are sterile one-way gloves, surgical masks and when you got long hair, also some surgical head coverage. When you got everything ready, you can start with our step by step psilocybin mushroom guide. Prepare your grow room and take a room that is not dusty or where you already got problems with mold. Set up the Bunsen burner and ensure a stable standing, in no event it should be able to fall on its side! Get the needle, magic mushrooms spore print and Petri dishes. But keep the lids on the petri dishes for now. They only should be opened if necessary and closed as soon as possible again. Put the magic mushroom spore print ready on your table. Now hold the front of your needle into the flame of the Bunsen burner. Keep it in there until it starts to get a bit red. Now let it cool down again. Now hold it into the flame again, but 3 to 5 seconds will be enough. Wait a few seconds again that it has not much more than room temperature and press it into the spore print, now open the Petri dishes and put the needle tip into the agar-agar and close the Petri dish again. All of that has to be done real quick, the Petri dish shouldn’t be longer opened than 3 seconds and it could be good to not take off the lid completely, just lift it and move it a bit, so that there is just a space of 1 or 2 cm that is exposed directly to the air. Do this with 3 Petri dishes and place them in a dark room with average temperature. Direct sunlight could be bad because it could heat up the Petri dishes badly. Humidity won´t be a problem, as the Petri dish is a nice small growing chamber. Within 4 to 10 days you will see how the magic mushroom started to colonize through the agar-agar. When the magic mushroom spores already colonized over the whole Petri dish, they are ready for the next step. Prepare a mix of 1 part Vermiculite and 1 part rice flour and 3 parts organic rye. Spread your mix in amounts that perfectly fit into the jars. Even if you make it sterile after this step, try to avoid unnecessary dust, dirt or bad environment like rooms with mold. Before closing the lid, add 2 small coffee cups of water into each jar. Put the preserving jars into the pressure cooker, seal it and put it on low heat. Since the preserving jars are made of glass, they could break when heated up and cooled down too fast. When the pressure cooker is on full heat, let it there for 60 minutes. The steam isn´t as hot as your Bunsen burner, so it requires some more time to make things sterile. After the jars are sterile, let them cool down to room temperature, but never open the lid of the jars, otherwise you would risk a contamination. Take the scalpel and your Petri dishes, which are now colonized with your hallucinogenic mushrooms. Sterilize the scalpel over the Bunsen burner, let it cool down, now open the lid of the Petri dishes and cut the colonized agar-agar into squares, so that you got around 5 to 10 of small colonized pieces. Put on sterile gloves now and maybe use long forceps that are also sterile. Get the jars, open the lid and push some colonized agar-agar pieces into them and close them again. Do this step like you did when putting the hallucinogenic mushrooms spores in the Petri dishes. Keep the jars in a place like you did with the Petri dishes, within a few days you will see how the colonization of the magic mushrooms dig through your feeding media. Here it is not very important when going to the next step, just let it colonize until half of the jar is filled. Prepare the same grow media mix you put in the jars, also add the same amount of water and put it in the pressure cooker. 15 minutes after full heat is reached, you can take it out and spread it on the ground of your grow boxes. The psychedelic mushrooms are still vulnerable to contamination, but not so fragile anymore. Take out the colonized material from one jar and mix it under the media prepared in the grow box. Do this quickly and don´t keep the box longer opened than necessary. Keep the box at 24 °C when using the type Psilocybe Cubensis as your magic mushrooms to grow; check every day if the box has a high humidity and that the media is always soaked with water. If you see the humidity does not fit, spray them with distilled water. Normal water from the bathroom contains unwanted guest already, depending on the quality of water in your area, which could even ruin a fully colonized box. Within a few days the magic mushrooms colonize the media in the whole box and than they start to form the parts of the mushrooms you love them for. 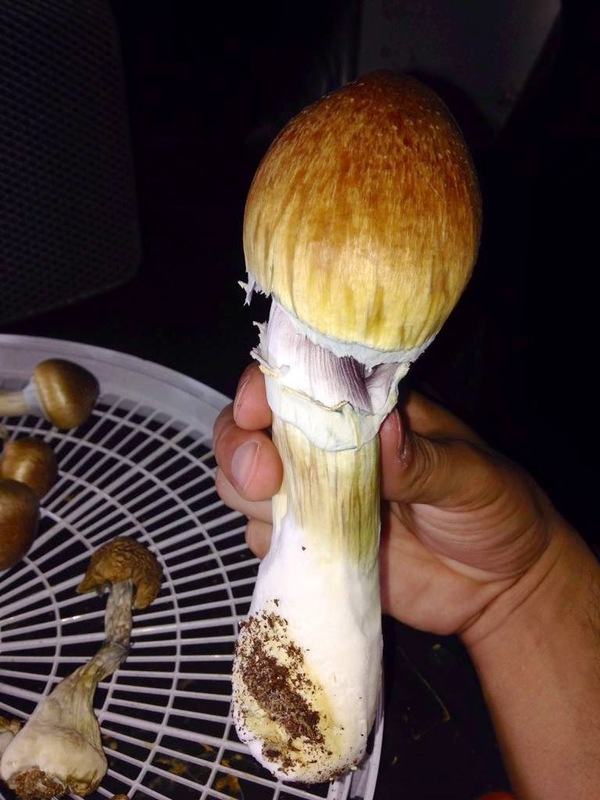 When around half of the flush has reached a size where the hat is about to open, harvest them. Take the magic mushrooms just above the ground and twist them gently, so that they come out almost from themselves and you shouldn´t pull with violence. When done, spray the box with water again until the media is wet again. The next flush will come within 2 days and is ready to harvest within 1 week. Repeat this to a maximum of 4 flushes. Even if there are more, they are not worth the time, just set up the grow box freshly prepared. Here you go, your own hallucinogenic mushrooms within just a few weeks! And when you got 2 or 3 boxes, you should be able to harvest around 1 kg fresh psilocybin mushrooms per week. Remember that 1 kg of fresh hallucinogenic mushrooms is 100 grams in weight when dried. Grow magic mushroom with grow kits are the easiest way to grow your own psychedelic mushrooms at home. Of course you could buy ready to use psilocybin mushrooms, but it has several advantages when growing them by yourself. First of all, magic mushrooms grow kits usually don´t cost more than an average dosage of dried magic mushrooms. Next thing is that magic mushrooms grow real quickly; you do not have to wait months to get your trip. But beside the financial aspects, there might be even better reasons to buy grow kits. In most countries psychedelic mushrooms are illegal and so you have to buy them from a street dealer, where you never know what you get. Or you buy magic mushrooms over the internet from reliable shops, but here the hallucinogenic mushrooms are shipped from countries where they are legal. That means, there is a small risk your mail is opened by customs. But like cannabis seeds remain legal in most countries, while cannabis is illegal, the spores of psilocybin mushrooms also remain legal in most countries. Magic mushroom grow kits do only contain a grow media and spores, so they are also legal like mushrooms spore syringes or spore prints. 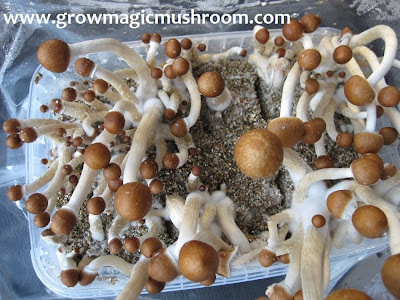 It’s very easy to grow magic mushroom at home and anyone can do it with great results. You only have to add water and a small place left in a shelf in your living room. -One plastic box with lid, containing the grow media that already contains the spores of the magic mushrooms. -One large plastic bag, where the box perfectly fits in and offers enough room for the magic mushrooms to grow. -One clothespin or paper clip. That´s it, the only thing you need is a fork and some water with room temperature. When you got your grow kits for your own psilocybin mushrooms, you can follow a simple step by step instruction. If you do not want to use your magic mushroom grow kits right away, you should place them in the fridge. Here are the temperatures low enough to make the spores of the psychedelic mushrooms stop growing and colonizing the grow media in the grow kits. They can be stored for several weeks that way. When you keep them at room temperature, the spores will continue colonizing the media, but there is not enough water to flush magic mushrooms after colonization. The lid of the plastic grow kits is the next problem, there wouldn´t be any room for them to grow. That would mean your grow kits could be ruined within a couple of weeks. Keep an eye on the grow media, if it has a white fluff covering most of it, it means your hallucinogenic mushrooms want to flush. First see if all parts are delivered and ready to be used immediately, box with lid, plastic bag, and paperclip to close the bag, a fork and lukewarm water. 1. Open the box and take away the lid. 2. Take your fork and gently stab a few holes in the grow media of the grow kit . If you make 2 rows with 4 stabs each, you already got enough. They are just needed to ensure the media can properly soak with water. 3. Slowly fill in lukewarm water, the media takes some time to soak it. Fill it until the box is completely full with water. 4. Put the lid back on the water filled grow kit . 5. Let the whole thing stand still for a day. 6. Take away the lid the next day and rinse out the spare water. 7. Let the water completely dripping out of the box, the grow media should have soaked up enough. 8. Fill the plastic bag with 2 or 3 cups of lukewarm water. This ensures a good humidity and will keep the plastic bag wide, so it gives enough room for the magic mushrooms to grow. 9. Place the grow kit in the water of the plastic bag. 10. Close the plastic bag. 11. Take around 1 to 2 cm of the top from the plastic bag and fold it 2 to 3 times, now keep it tight and closed with the paper clip. 12. 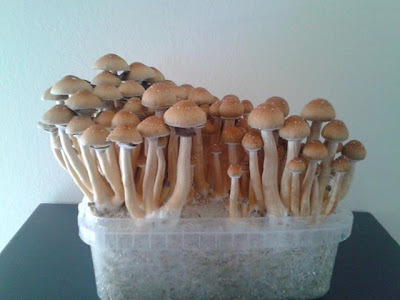 Put the grow kit in its final spot to grow, do not move it around, growing psilocybin mushrooms don´t like it if they are carried around every 2 or 3 days. 13. Fungi do not need direct light, so it doesn´t matter where you place your magic mushroom grow kit , but best not directly into the sun, as it could be a bit too warm also. 15. Take a look at your grow kit each day, when you see the first psychedelic mushrooms, keep an eye on the box and media. It should be always wet. 16. Do not open the bag, the magic mushrooms need a very high humidity and if opened each day they could dry out or slow down their growing. 17. After a few days your magic mushrooms should be ready to harvest, the best time is before the hat opens. So your magic mushrooms will look a bit like a lollypop. 18. When harvesting you have to pick out each magic mushroom one by one. Just take it a bit above the media and gently turn it. The mushroom will “plop” off the media; do not just pull them out. 19. Fill the grow kit with water again and put the lid on it. 20. This time you only need to let it soak for 2 hours, the media is still wet and don´t need more time. 21. Now replace the water in the plastic bag. 22. Take off the lid from the grow kit and put the box back into the plastic bag. 23. Close the bag and keep it like before, but this time your hallucinogenic mushrooms will show up much faster. The media is fully colonized and so there is no delay. 24. Keep checking the box each day, already at the next day you can see the second flush coming. 25. Keep continuing this cycle until there are no more magic mushrooms growing in the box. 26. When doing everything properly, looking out for perfect growing conditions and with a pinch of luck, you could even receive 3 to 5 flushes with your grow kit . The grow kit will give you far more than just a single dose per flush, so take what you want to consume with your friends now and put the rest of the magic mushroom on a news paper. Just spread them properly on the newspaper, so that none of the magic mushrooms are touching each other and got room to get rid off the water. To speed up their drying process, you can also place the paper with the psilocybin mushrooms on a clothes-drying rack. So they got air from all sides and will dry a bit quicker. 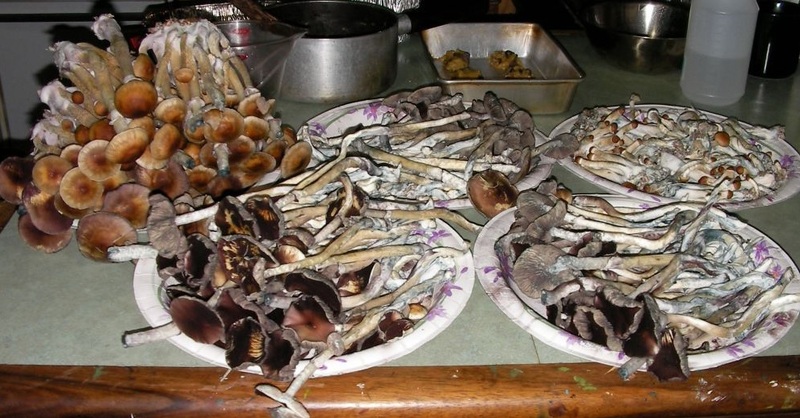 Turn the magic mushrooms every day, so that they equally dry from all sides. Do not put them in the oven for quick drying or placing them on or in front of a heating device. The psilocybin mushrooms would loose some of their psilocybin through the heat; psilocybin does not like temperatures above 38 degrees. Depending of temperature, humidity and air circulation in your room, they are fully dried within 4 to 7 days. Keep in mind that psychedelic mushrooms contain more than 90% water. So when you harvested 400 grams of fresh magic mushroom, you will have around 40 grams after drying. We hope that this article gives you all the necessary information to grow magic mushrooms using grow kit easily and successfully! If you see that the magic mushrooms look a bit limp and maybe get slightly black borders on the hat, this could mean humidity is too high. When you see it before there are any black stains and not much happened yet, open the plastic back for 15 minutes, than close it again. Until they are ready for the harvest, there should be no more actions required. When the hallucinogenic mushrooms already got black stains, harvest them immediately, as they won´t continue growing. Soak the box with water again and repeat everything, maybe open the plastic bag every 3 days for 3 to 4 minutes. Always wash your hands when working with the grow kits, to avoid contamination of mold and bacteria. They will grow even faster and they prefer the same climate, so any contamination will ruin your grow kit . Do not open or work with the grow kits in dusty and/or dirty rooms. The usage of Magic Mushrooms could be as old as humanity itself! There are several theories about Magic Mushrooms (also well known as hallucinogenic mushrooms, psychedelic mushrooms or psilocybin mushrooms) and the beginning of their usage. But the truth is, nobody knows for sure when humans begun to eat psilocybin mushrooms to travel into other worlds or dimensions. The earliest time span, where the usage of psychedelic mushrooms can be proven, is during the time of Inca and Maya tribes. But we can be pretty sure that they also had been used by other people all around the globe, because psilocybin mushrooms can be found in nearly every region of this world. Good candidates are Africa, since the first humans we are today come from there, Asia and Europe. The traditional usage of magic mushrooms was mainly found in America and a few regions of Asia. In Europe the traditional usage must have been discontinued hundreds or thousands of years ago. But it came back in the 20th century, through the hippy generation, pop culture and today, the Psychedelic and Goa trance culture. What exactly they used the mushrooms for is yet unclear; scientists still try to find out more of the magic mushroom history in their documents, scratched in stones. 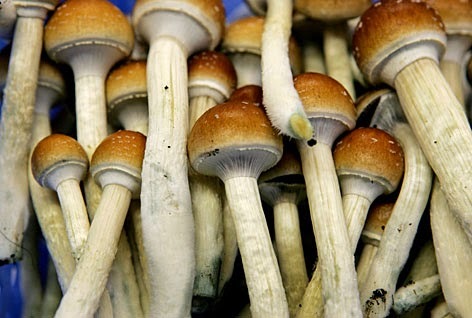 But what they currently know about hallucinogenic Mushrooms, is that they where used in healing, spiritual and religious ceremonies from the Maya and Inca tribes. But of course they where not the only medicine used in these days, so we do not know for which wounds, illnesses or infections they might have been used. It could be that magic mushrooms where used to get in touch with the afterlife, during spiritual ceremonies. As a way to hear the voices of their gods during religious rituals. Some scientist even believe the healing usage was very advanced and so they used the hallucinogenic mushrooms to heal mental diseases. The development of the Inca culture still counts to the stone age, because they build everything with stone. No matter for what, buildings, weapons or to write down history for future generations. But what we understand under stone age, doesn´t properly fit to the rest of their knowledge. They already gained a huge knowledge of stars, farming, martial arts, watering systems and many more. So it is indeed very likely that psilocybin mushrooms where used to heal mental disorders. Just a few years ago, our modern medicine picked these psychedelic mushrooms up again. Simply because a study had proven it has a very positive influence on depressive people and the positive effects don´t fade quickly, nor the patient has to consume them through many sittings, just one consumption of magic mushrooms in a proper setting can help for up to 6 months. Sure the Inca where not a peaceful and lovely civilization, it is true that they killed people in rituals to make the gods merciful to them. For example, those periods of rain and sun are well for the plants of the farms, so that they have a lot of food ready. Since documentations was very difficult in the early days, most delivered knowledge of these times was found as art painting in caves, scratched in stone or was puzzled together through items found from these times. Also the languages do not even exist anymore, so it is even difficult to read documentations, because first every letter or symbol of the writing has to be translated. Some say that the psilocybin mushroom can be followed through the spreading of Psilocybe Cubensis. It is the most spread psychedelic mushroom in the world. Of course you can always find a local psilocybin mushroom, but in every tropical and sub tropical climate you also find at least one of the many Psilocybe Cubensis variations. But they seem all to have one single origin in Africa and where spread with the expanding humanity. So it could be thought it was transported as psychedelic mushroom already, but it´s more likely that it was transported by the animals which the humans took with them for stockbreeding. Cows eat the grass where they live and of course they often eat stuff that is growing between the blades of grass. For sure there also had been some Psilocybe Cubensis eaten by cows. When they where through digestion, some spores could have come out with the dung again. So it went from Africa, to Asia, America and some parts of Europe. The occurring of the magic mushroom type Psilocybe Cubensis is no proof for the usage of hallucinogenic mushrooms in general. Another fact that it must have been spread when humanity colonized the continents for the first time is the large difference between the variations. 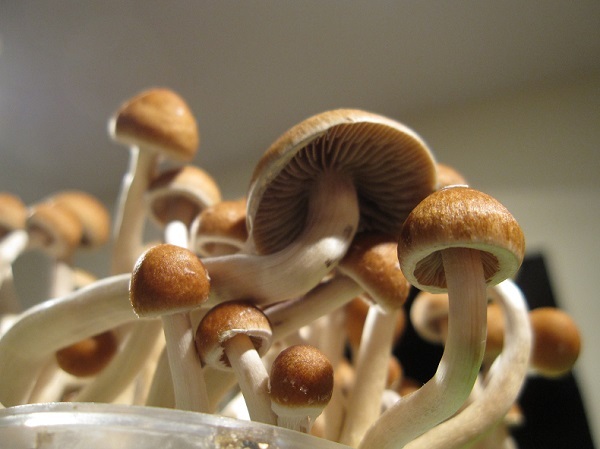 For most of these Psilocybe Cubensis variations it must have taken thousands of years in evolution to become so distinct from their African ancestors. Terrence McKenna was a well-known scientist in the hippy era, many respected him, but a lot of people claimed he has a mental disease, too. Oh and yes, the strain Psilocybe Cubensis McKenna is named like him, to show him respect and to make him never forgotten. He even had a very wild theory, that humans are only the intelligent life form we are today, because of hallucinogenic mushrooms. He said that the human was just a monkey like animal, not very intelligent and by far never able to send a rocket to the moon, no matter how many million years of evolution they would have. Sometimes these monkey like animals came across the psilocybin mushrooms and had eaten these, through their effects they repeated to eat them and to make others join. And through the long years of eating psychedelic mushrooms, humanity gained an evolution booster. Since magic mushrooms are often described as “mind expanding” among other drugs like LSD and Mescaline, it seems logical that a permanent influence of those substances could slowly lead to a further developed brain in the future. But nothing of this theory is build on any scientific research or fact that had been found already. And without any doubt, we will never find one. It can not be estimated if Europeans started to use these magic mushrooms in the same time the Indian tribes in America did, but here there was also a stronger demand for magic mushrooms. When the Vikings started to spread over Europe, they also brewed an alcoholic drink called “Met”. Most of you will know of it already, but in most cases the ingredients are just made to properly fit into normal food regulations. In the time of the Vikings it was a wild mix of whatever could enhance the effects of the ethanol. The Met contained in most cases way more than alcohol, things like henbane, fly agaric and psilocybin mushrooms. Of course in the cold climate of Europe they where not able to use the Psilocybe Cubensis, they used other hallucinogenic mushrooms which are local. For instance there is the Psilocybe Semilanceata, also known as “Liberty Caps”. The last big cultural usage of psychedelic mushrooms was in the Indian tribes that lived in America before the Europeans took over. So Land was bought, a lot get into alcoholism as the “fire water” was totally new for them and old traditions had been gone and forgotten over times. But since these rituals still exist partially, the delivered chronicles of hallucinogenic mushrooms in these days are very complete. In most cases it was also used in religious ceremonies, a large part of these natives used them to speak with people in the afterlife, like grand parents or to get support from their spirits and gods. When the modern civilization started its research on mescaline in the 20th century, the psychedelic drugs where a big topic in all media, just because the people where unable to even imagine the effects of them. When LSD started to crawl up and finally formed a whole generation, the spread of other psychedelics like hallucinogenic mushroom grew with it. People started to want more psychedelics than just 2 or 3, because each has it unique aspects in their psychedelic effects. Since these days, the use of magic mushrooms didn´t disappeared again and even remains as recreational drug today. 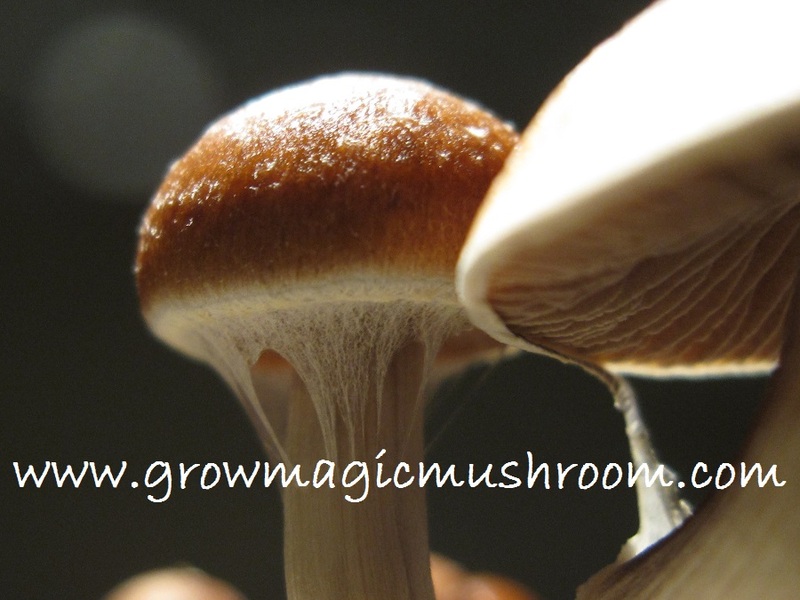 Copyright (c) 2013 Grow Magic Mushroom. Designed for Grow Magic Mushroom.